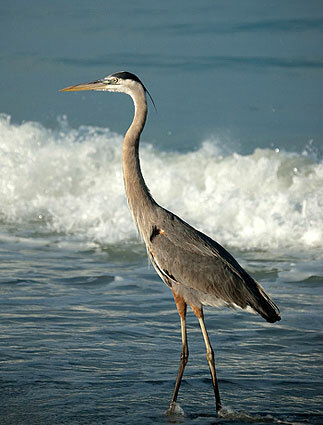 The Great Blues are the largest of the North American herons with long legs, a sinuous neck, and a thick, dagger-like bill. Its head, chest, and wing plumes give a shaggy appearance. In flight, the Great Blue Heron curls its neck into a tight “S” shape; its wings are broad and rounded and its legs trail well beyond the tail. It appears blue-gray from a distance, with a wide black stripe over the eye. In flight, the upper side of the wing is two-toned: pale on the forewing and darker on the flight feathers. A stealthy hunter, the Blue will stand motionless as it scans for prey or wades belly deep with long, deliberate steps. They can strike like lightning to grab a fish or snap up a gopher. Blues may be seen in the tide pools at Doheny at low tides and on the harbor breakwaters. They will also be seen and heard in their tree nests.